News about our Blues in the Schools program. Blues In the Schools Needs Your Support! DID YOU KNOW? 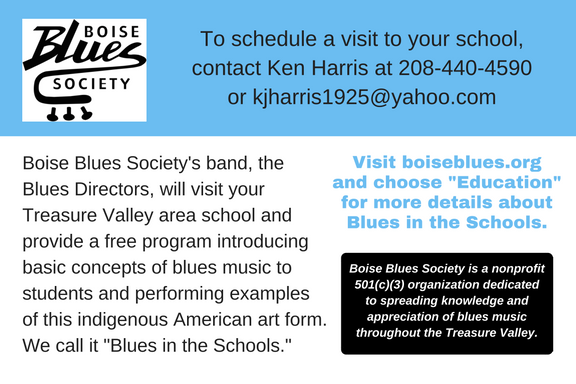 Boise Blues Society (BBS) is a non-profit organization with a mission of promoting blues music through a wonderful program called Blues In the Schools (BITS). Its part of a nationwide program involving dozens of blues societies and is especially important now because funding for music programs in public schools seem to be a priority target for budget cuts. We’ve also presented BBS Student Scholarships to several outstanding young musicians in the Treasure Valley.